Professional golfers not only play, but play well. Sometimes that means having the type of product designed to optimize the game beyond that of the club or ball. Promotional divot repair tools are a must for the serious golfer, so how can it be not a great investment for a country club? Brand them, market them, merchandise them, sell them — spread the word to golfers in your area. They then show up for more golf games, which means more revenue for you. Keep in mind that you have clubs. You have balls. You have sandtraps. Additionally, you have ponds. A lot can go wrong at a golf course. The one thing a golfer does not need is to bust the divot! 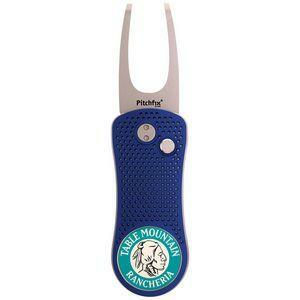 The divot repair tool takes care of a lot of issues, and oftentimes that’s the one thing a golfer does not have. A country club even offering such tools for free can be the ultimate marketing strategy, ensuring they come back for the next outing. BRAVA Marketing has them all right here. All sorts of packages and designs: you have the ability to choose the kind of design you want right here. Set it up, make an order, and the rest is history. You only need to contact us right now. You have questions? We can answer them. Let us know what you think. Country clubs can kill it with their own promotional divot repair tools, so take note: it’s time to get competitive, just as much as golfers do. That golf course of yours shouldn’t be empty. It should be teeming with golfers, caddies, and carts. Don’t hesitate. Act now. Make your order. And provide that service to your customers they wouldn’t otherwise get anywhere else!